Inman: OK guys, we need to create the most ridiculous game concept in the history of mankind so I can have an excuse to draw a cat shaped like a taco. What are your thoughts? Lee: I’ve got it! 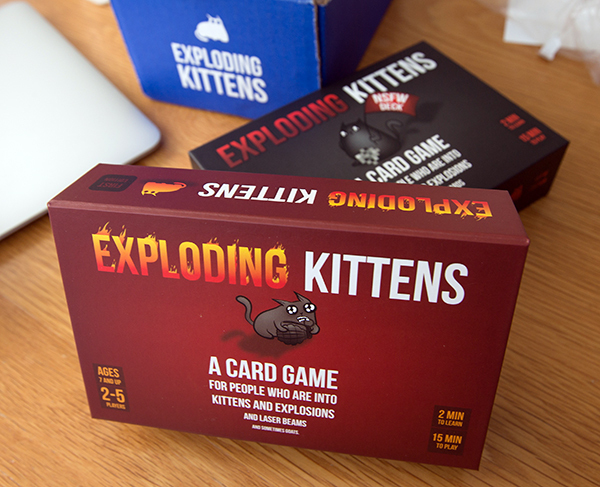 A game where we draw a bunch of funny versions of cats… that EXPLODE! Small: Brilliant! And we should totally add back hair, unicorn enchiladas, worm holes, and goats into the mix! Inman: Whoa, hold on guys. This idea… NEEDS MORE LASER BEAMS! That’s what I think happened, and if you tell me it went any other way I won’t believe you. Now to get into the gam eplay itself; you can pick up this game and be a master at it within about 5 minutes. The concept at its core is a card game equivalent to Russian Roulette, with some added twists and strategies to make the game more interesting. 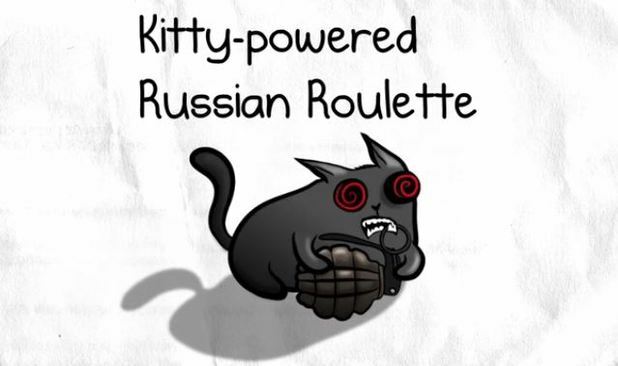 You draw and play cards until you draw an exploding kitten card, and unless you have a defuse card (you get 1 at the beginning of the game and more are added to the deck) you lose the game and are “out”. The last player standing is the winner. There was a lot of creativity, randomness, and art all thrown together and added into a deck of cards. It ends up being a very fun game that makes you laugh almost constantly as you play, especially for the first time. The gameplay is simple but gets exciting as the game gets closer to the end, and even losing early isn’t so bad because you can watch events unfold quickly from the sidelines. Replay value is moderate; you will want to play the game multiple times when you first get it, but it will probably be a game you will play in bursts. Once you’ve read all of the cards and laughed at their wit and humor, it won’t be the same game experience until you take a break from the game for a while. In addition, the simplicity is great for first time players but also makes the game less captivating after a few playthroughs. Ultimately games are supposed to capture your attention, bring you and your friends together, and be fun. Exploding Kittens does all three of these things and does them well. I highly recommend this game as a fun alternative to actual Russian Roulette, which I hear is not the best way to spend an evening (citation needed). 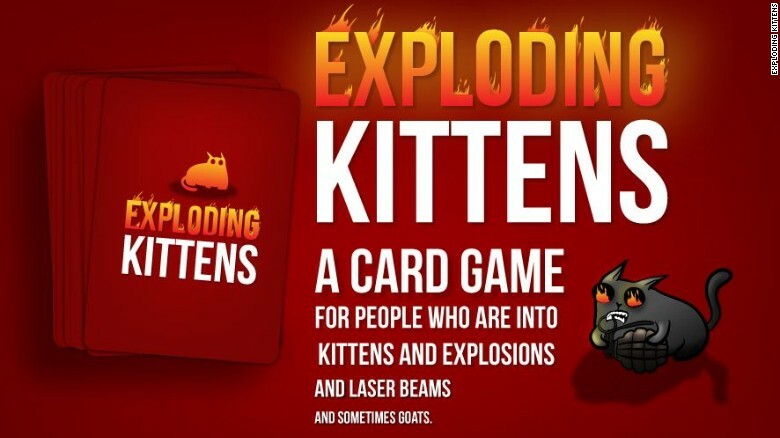 This entry was posted in Card Games, Game of The Week, Just Discovered Games and tagged Board Game of the Week Exploding Kittens, Card Game Exploding Kittens, Exploding Kittens Review by godirectlytogaming. Bookmark the permalink. Such a fun game! I love the fast paced nature of it, and the simplicity, but most of all it’s the humor involved in every card. Even if I were to get attacked, the gutter-inspired card descriptions definitely help to ease the pain!